Today is aadi perukku / aadi 18 and like I made this aadi perukku lunch menu last year, this year too, being a Sunday, I made special lunch and offered God. But unfortunately Vj had to go for work today, so I finished cooking soon and he had directly lunch and left to office. This lunch menu is similar to the full meals I had already posted, so I am not elaborating on how I prepared this menu. Just I am linking the recipes. Though I made sambar, rasam, curry, kootu, I offered God only the items that had no onions in it. Apart from this lunch offering, we pray early in the morning too, with raw rice soaked with jaggery and tie yellow thread too around neck. 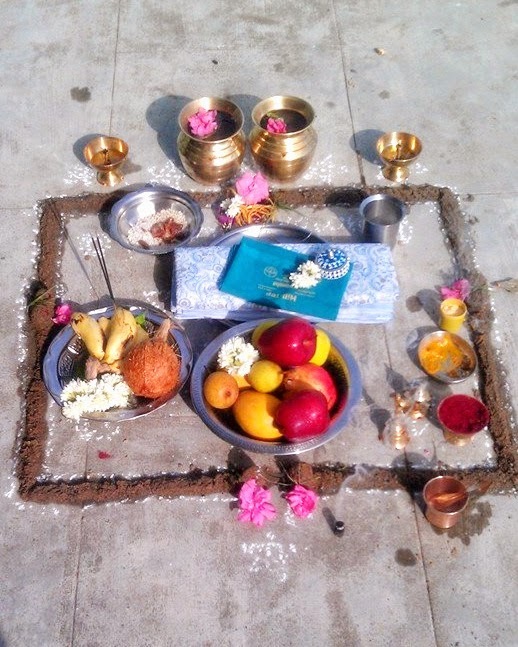 And here is how my mom, performs her pooja at the motta maadi (Terrace) in our home at Salem, assuming as the holy river bank Cauveri . She brings manal (river sand) and makes a square out of it and keeps manjal pillayar ( Ganesh made out of turmeric powder) and offers the fruits, rice soaked and mixed with jaggery, a black glass bangle coupled with pink tainted dried palm leaf strip, a new saree with blouse bit, some jewels, mirror, flowers, etc..along with the holy yellow thread above. New custom Rak i am knowing from u.We Tanjoreans do the pooja in the kinathadi. Wat a spread, am drooling..
Looks so good…Lovely spread too! Here in Singapore both of us can take a sombu of water and offer it to God or show deeparathanai to Kitchen sink tap.In some way water should be worshipped right?